SURPRISE, Arizona – It's been a whirlwind of a spring for the Uribe family. But a quick glance at the Angler of the Year standings for the FLW Costa Series Western Division will show you that's it's also been a very productive one. Sitting in first place in the AOY race for the pro division: Bridgford angler Joe Uribe, Jr. Sitting in first in the AOY race for the co-angler division: Bridgford angler Rachel Uribe, Joe's younger sister. With one regular-season event remaining on the 2018 Costa schedule, the Uribes have a legitimate shot at accomplishing something that's never been done in the history of tour-level tournament bass fishing: a brother and sister claiming AOY trophies on the same tour, in the same year. "There was a father and son who did really well some years back in the BFLs, but there's never been a brother and sister who did as well as the Uribes," says Bill Taylor, FLW's Senior Director of Tournament Operations. "It’s rare that both a bother and sister even compete, but when they both have a chance to win AOY in their respective divisions, that’s unheard of, and pretty awesome." Joe, Jr. claimed the AOY lead after a third-place finish at Clear Lake in May, and heads into the remaining event on the California Delta (Sept. 27-29) with an 11-point lead over Nick Nourot (491 to 480). Rachel also moved into the top spot after Clear Lake, thanks to a 14th-place finish. She has a scant 2-point lead (476 to 474) over Ralph Wells. The spot atop the AOY standings is a familiar one for Joe, Jr.: he dominated the Western Division in 2015, winning two events on the way to a 40-point win in the AOY race. Rachel has finished in the Top 15 of the co-angler standings two of the three previous seasons she's competed (she was 11th in 2015, 14th in 2017). "It's just so cool to be able to experience all this together as a family," Joe, Jr. says. "The biggest thing for us is that everybody is involved: my dad, my mom, my sister and I. We're so fortunate to have that opportunity." The Uribe name is a familiar one to West Coast bassheads. Joe, Sr. has fished various circuits (ABA, WON Bass, etc.) for years, and the father/son team made a name for themselves in the 1990s fishing ABA team tournaments in Southern California. Joe, Jr., however, picked up that momentum and carried it forward shortly after graduating high school in 1997. "I got a job as a bank teller, did that for a year, saved up money from team tournaments and work, and told my parents in 1998 or 1999 'I want to go fish the Bassmasters'," Joe, Jr. says. "That’s when we still had the B.A.S.S. Western Invitationals. I didn't have a boat at the time, so I'd borrow a friend's boat every tournament. I didn't do great that year, but it gave me my introduction to a different level of competition." Uribe took a job in boat sales at Anglers Marine in Anaheim, Calif., and bided his time for the next few years ("Studying and really analyzing the business, the fisheries, the competition," he says). In 2003, with the support of a sponsored boat from Angler's Marine, Uribe made his re-entry into the West Coast tournament scene, fishing the 2003 WON Bass Pro-Ams. He cashed a check in the second event of the season, and then did the unthinkable for a rookie: won the third event, on Lake Mead. "I just remember a lot of mentors of mine like Don Iovino and Pat Donahoe telling me 'You're not supposed to win your first year', but I was young, I didn't know any better," Uribe jokes. "It all kinda sunk in then: how much I love the competition, and more so, the camaraderie." Uribe finished second at the next event on Lake Mojave, walking away with Rookie of the Year honors and gaining a firm foothold in the hyper-competitive Southern California bass scene. Uribe fished the FLW Series Western Division from 2007 to 2010, and then hit his stride in the Costa Series in 2011, finishing second in the Western Division AOY. He followed that up with a fourth-place finish in 2012 and a fifth-place finish in 2013, and then had his breakout year in 2015, winning two events. "I tried so hard for so many years to win one of those FLW events, but I couldn't ever quite get over the hurdle," Uribe says. "It was pretty frustrating. Finally, in 2015, I just let all that go. I ended up having one of those dream tournaments (in my win at Lake Havasu), where everything happened just the way I imagined it would. After that, it was over. All that pressure I had put on myself was gone." 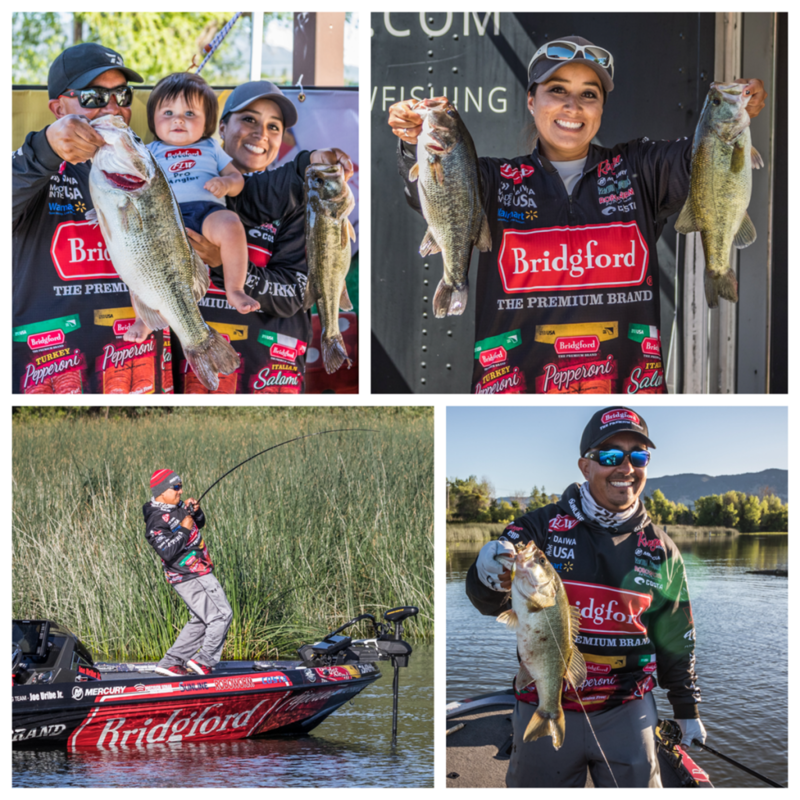 Uribe has collected 12 Top 10s and three wins in 26 Costa events, and was a regular on Western Outdoor News' "California's Top 40 Bass Anglers" list, penned by Fresh Water Fishing Hall of Fame writer George Kramer. "The thing that's so impressive about Joe is that he can show up at these major California tournaments on the Delta or at Clear Lake – 14 to 17 hours away from home – practice for three days, and be competitive to win almost every time," says Kent Brown, host of Ultimate Bass Radio in Sacramento. "Joe doesn't get to spend nearly as many days on these lakes as most of the other guys fishing the Costas, but he shows up and fishes them according to the conditions. "He's does a lot of things really, really well: he's not just a good swimbait fisherman, he's a REALLY good swimbait fisherman. He's not just a good finesse fisherman, he's a REALLY good finesse fisherman. And he's a great ambassador for the Bridgford brand. He's well-spoken, he's friendly, he's always enthusiastic and willing to work to help promote the brand. He's a great representative." Editor's note: This is Part 1 of a three-part series on the Uribes. Next week, find out about Rachel's fishing journey.